For those who think the desert is a lot of hot sand and cactus, here’s a reminder that it’s also teeming with God’s creatures! 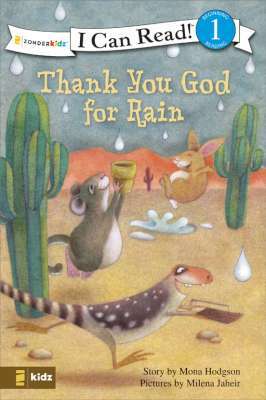 Another entry in the I Can Read™ series of books for early readers, Thank You, God, for Rain reminds youngsters that we should be grateful for even the simplest things. Intended for level-two readers, Thank You, God, for Rain is peopled with a variety of desert critters―from owls, wrens, and roadrunners to jackrabbits, lizards, and crickets―all of whom have reason to be thankful for a cool summer rain. And the clever twist at the end―they pile into a play swimming pool filled with rainwater―is sure to delight young readers! A Lesson in Teamwork, especially appeals to ages 4-7.